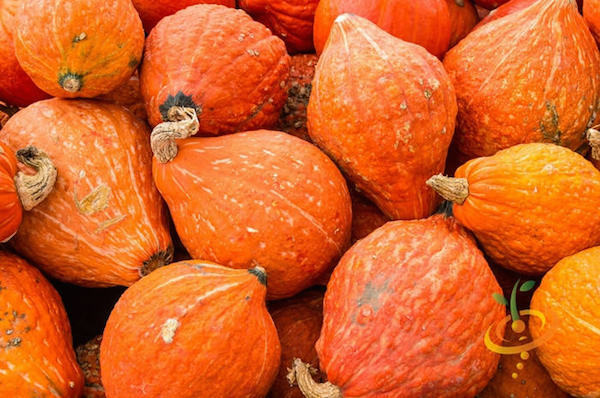 Winter Squash Varieties—like acorn, butternut, buttercup (kabocha), Hubbard, and Spaghetti—are left on the vine to size up and ripen all summer, harvested in the fall, and eaten all through the winter. They’re called winter squash because you eat them through the winter, not because you can grow them through the winter. Hard frost kills them, and even if they survive in mild-winter areas, they need summer heat—and flying pollinators—to set and ripen fruit. 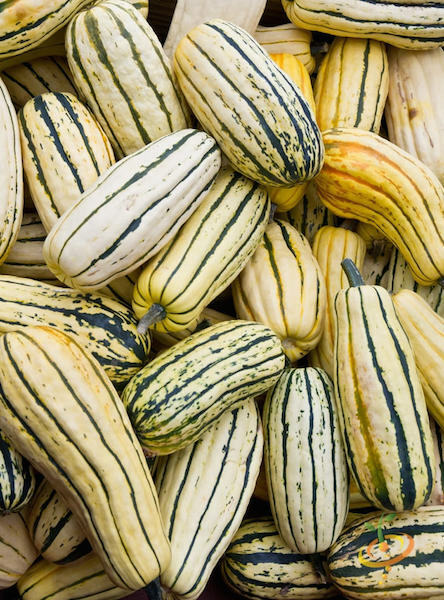 Summer squash—like zucchini, crookneck, and patty pan—are harvested small, while the skins are still soft. For zucchini varieties, click Here. 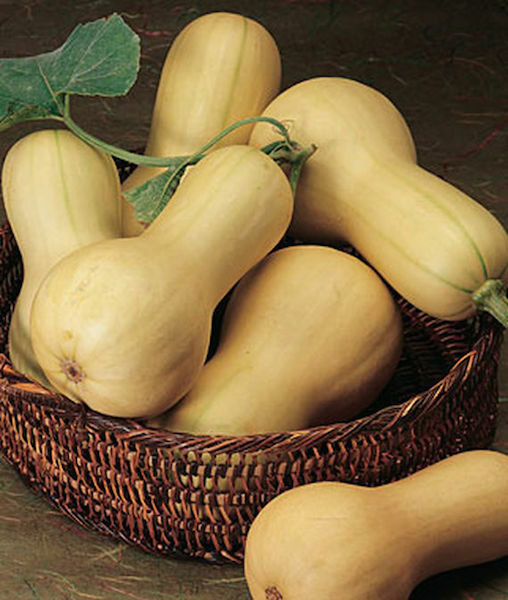 For other summer squash varieties, click Here. Winter squash and summer squash are closely related, and share similar soil, fertilizer, irrigation, and cultural needs. For information on growing squash, click Here. 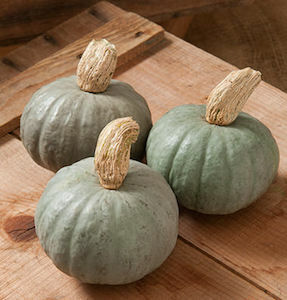 Two—Yes, Two—‘Bonbon’ Winter Squash Plants! 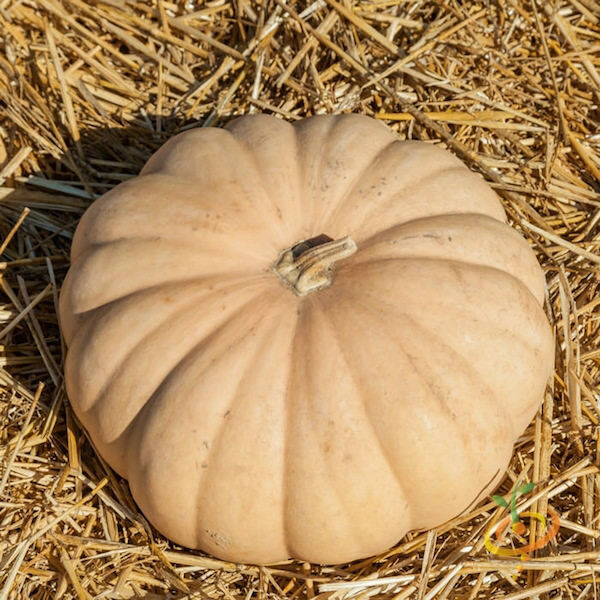 Winter squash varieties can be divided into acorn, delicata, buttercup (kabocha), butternut, hubbard, and spaghetti squash types. 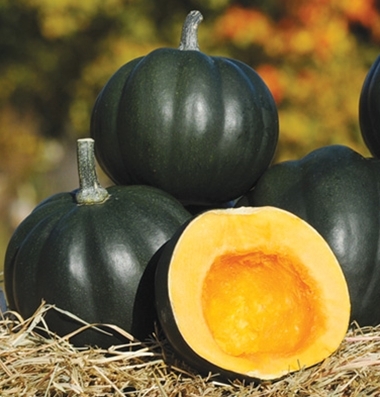 The larger Hubbard winter squash varieties can easily run to 20 feet (5m). 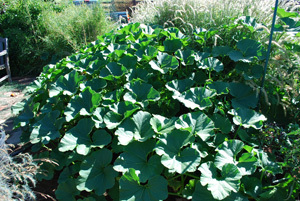 Winter squash need space to ramble. If you don’t have much space, or if you’re growing squash in containers, look for compact bush varieties in the descriptions below, like ‘Honey Bear’ acorn squash or ‘Discus Bush Buttercup’. 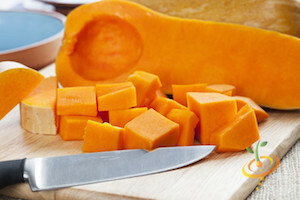 Small, ribbed squashes are delicious baked. Most have mildly sweet yellow flesh. Acorn squash do not store as well as other winter squash, so use within 3 months of harvest. Sun curing not necessary with acorn squash. ‘Table Queen’ (Heirloom, 85 days) produces dark green, flavorful fruit with dark orange flesh on compact bush-type vines. Suitable for container gardens and small space gardens. 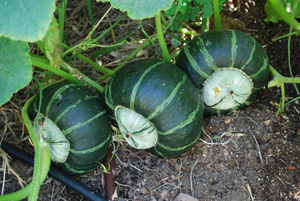 ‘Honey Bear’ (F1 hybrid, 100 days, resistant to Powdery Mildew) produces dark green, 1-lb (0.5kg) fruit on compact, prolific vines suitable for small and container gardens. ‘Delicata’ (Heirloom, Open-Pollinated, 105 days) squash are 7-9” (18-23cm) long and 3-4” (7-10cm) wide oblong squash, with pale yellow skin and green stripes running down their sides. Sweet, light orange flesh. Smooth texture. Stores well in cool, dry conditions. Buttercup squash have sweet, somewhat dry, yellow-to-deep-orange flesh that’s perfect for fall soups and stews, or simply roasted and served with butter. Some varieties are starchy immediately after harvest, but sweeten up after a few weeks of storage. Stored cool, dry, and dark, buttercup squash keep for about 9 months. They're at their best at 2-4 months. ‘Bonbon’ Buttercup (F1 hybrid, 95 days) is the best buttercup squash I’ve grown. The large vines produce 4-10 blocky, dark green, smooth-skinned fruit. Sweet, smooth-textured flesh, especially roasted. 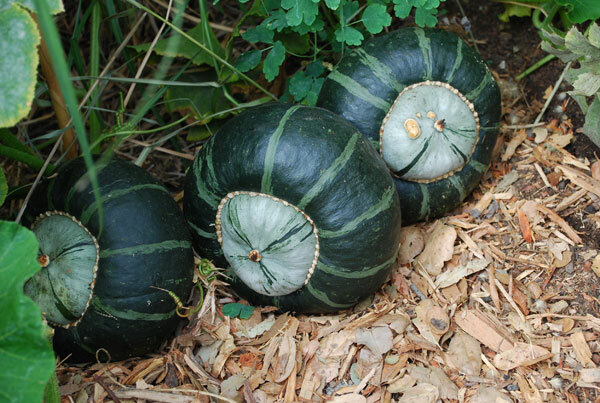 If you have the space for some large vines, grow this squash. 2005 All-American Selections winner. ‘Burgess Buttercup’ (Heirloom, Open Pollinated, 90-95 days) is the classic buttercup squash, producing 3-5lb (1.4-2.2kg) dark green, blocky fruit. Deep orange, sweet flesh grows sweeter during storage. 3-4 fruit per plant. Large, rambling vines. Similar to 'Bonbon', but open pollinated (non-hybrid). 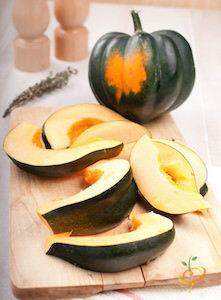 ‘Winter Sweet’ (F1 Hybrid, 95 days) is one of the best winter squash we've tasted. Sweet, flaky, and smooth, the flesh is a rich, deep orange, wrapped in a blue-grey rind. Fruits average 4-5 lbs (1.8-2.3 kg), and the large vines produce 3-5 fruits per plant. Resistant to black rot in storage, so they keep a long time, but they're best eaten 2-4 months after harvest. ‘Cha Cha’ (F1 Hybrid, 90-95 days) produces dark green, slightly flattened kabocha squash weighing in at 4-5 lbs (1.8-2.3 kg). The dry, flaky, deep orange flesh is very sweet. 3-5 fruit per plant. 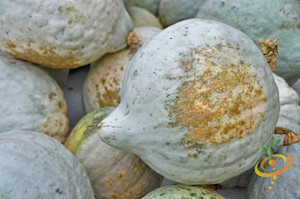 ‘Shokichi Shiro’ (F1 Hybrid, 100 days) produces perfect mini kabocha squash with mottled blue-grey skin. Weighing in at 1/2- 1 1/4 lbs (half to 3/4 kg), they're the perfect size for individual servings. Delicious sweet orange flesh. Average yield 5-8 fruit per plant. ‘Discus Bush Buttercup’ (Open Pollinated, 90 days) produce 3-4 dark green, 3-lb (1.4kg) fruits on compact bush plants that grow to about 3’ x 3’ (1m x 1m). Great for small gardens, these can even work in large container gardens like half-barrels. 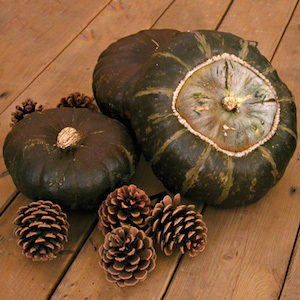 ‘Muscee de Provence’ is a rare winter squash from the south of France that has become rare over the past few years. The flattened 5-10 lb. 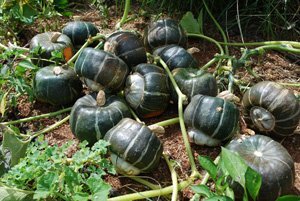 (2.2-4.5kg) fruits age from mottled to a smooth orange terracotta finish, and have deep ridges that radiate from the stem, and sweet flesh. Can be stored the entire winter if stored cool, dry, and dark. 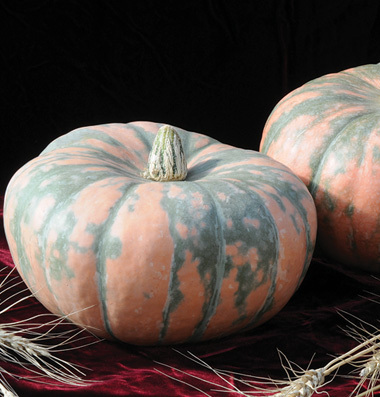 ‘Lakota’ (Heirloom, 85-100 days) Plant breeders have recreated a stunning winter squash once prized by the Sioux but long lost to cultivation. Lakota is as colorful as an Indian blanket with the fine baking quality of Hubbard. Fine-grained orange flesh is sweet and nutty. Mature fruits are 8" x 9" (20 x 23 cm). ‘Speckled Hound’ (Heirloom, 95-100 days). Marvelously concentrated sweet, nutty squash flavor. 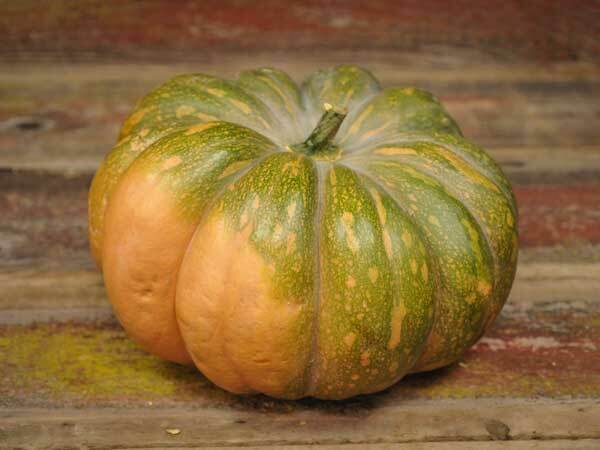 Produces to 3-6 lb (1.4-2.7kg) squash with a mottled green-and-orange rind and dense yellow-orange flesh. Strong broad foliage protects the fruit from sun and insect damage as it matures. 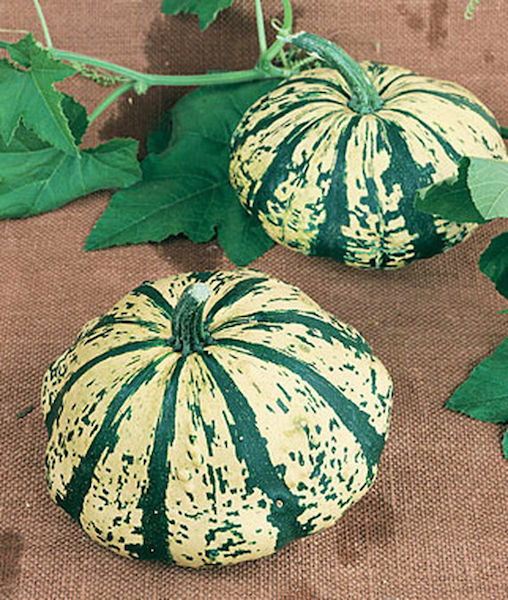 ‘Verte Et Blanc’ (French Heirloom, 60-70 days) produces beautiful, slightly scalloped winter squash that ripen from pale green to creme-colored, streaked by dark green. A gorgeous winter squash that can be sauted, roasted, or stuffed. Compact 3-5' (1-1.5 m) vines will work even in small gardens. ‘Long Island Cheese’ (Heirloom, Open Pollinated, 100 days) produces large, flattened tan winter squash resembling wheels of cheese. Sweet orange flesh is delicious baked or made into pies. Widely grown in the northeast. Butternut squash store better than most winter squash, and can still be delicious 9 or 10 months after harvest, if stored cool, dry, and dark. 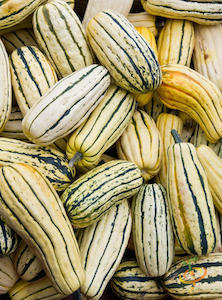 They have small seed cavities and dense, sweet flesh, perfect for baking, soups, or "spiralizing" into squash noodles for low-carb diets. 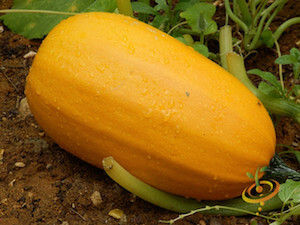 ‘Waltham Butternut’ (105 days) is the classic oblong butternut squash. 9” (23cm) fruits, 4-5lbs (1.8-2.2kg). Small seed cavities, dense flesh, excellent for baking, roasting, or making soups or stews. Produces 4-5 fruits/plant. Compact vines. ‘Burpee Butterbush’ (F1 hybrid, 75 days) is a compact bush variety that produces butternut squash similar to 'Waltham'. Vines run 3-5' (1-1.5m), so they're excellent for container gardens and small spaces. Plants produce 4-5 fruits per vine. 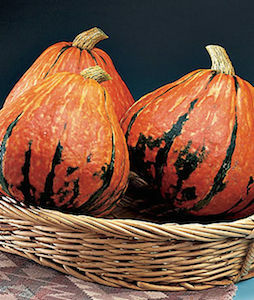 Hubbard squash were pioneer staples that helped early settlers survive harsh winters. They produce large, heavy fruit that can be stored for months. Like pumpkins, Hubbard squash tend to have rampant vines that need a lot of room to ramble. 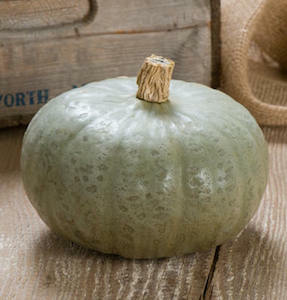 The varieties listed below are slightly smaller than traditional Hubbard squash, and the vines aren't quite as large, but still, Hubbard squash are not a good choice for small gardens. 'Hubbard Baby Blue' (Heirloom, Open Pollinated, 100 days) produces large, 7-lb (3 kg) blue-grey fruit with sweet orange flesh. Excellent for baking or roasting. 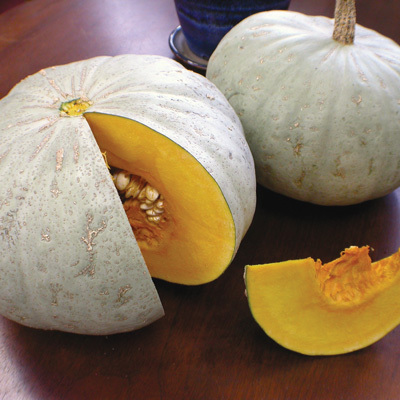 ‘Golden Hubbard’, (Heirloom, Open Pollinated, 100 days) produces large, orange-skinned 10lb (4.5kg) squash with smooth, golden flesh. Perfect for pies or canning. 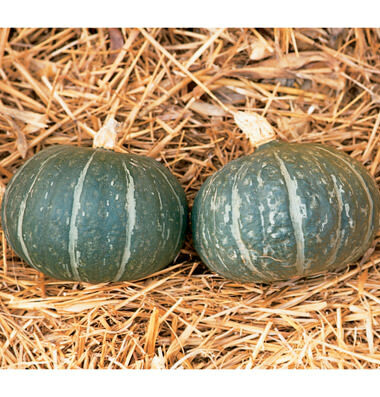 ‘Sweet Meat’ (Oregon Heirloom, Open Pollinated, 95-115 days) produces huge 10-12lb (4.5-6 kg) slightly flattened squash with beautiful, blue-green skin. The flesh is deep orange and very sweet. Stores for a very long time. 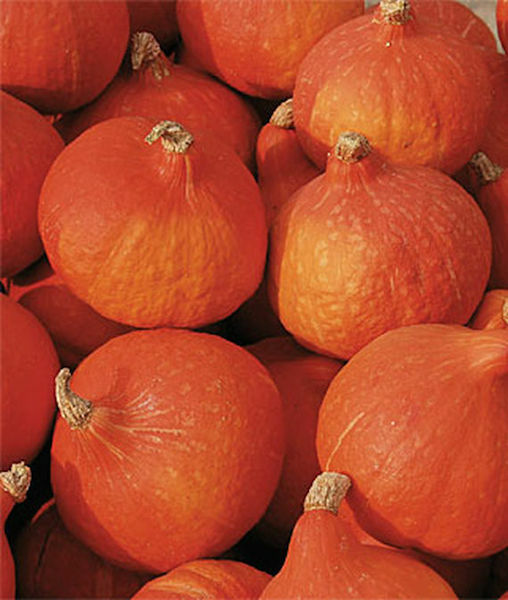 ‘Red Kuri’, a.k.a, ‘Orange Hokkaido’ (92 days) produces scarlet-skinned, drop-shaped 4-7lb (1.8-3kg) squash with smooth, orange flesh. 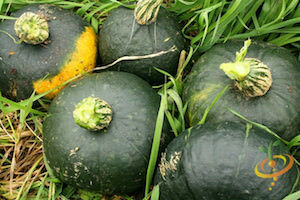 One of the best winter squash to grow. Spaghetti squash have fibrous flesh that can be separated into delicate strands, like pasta. They're excellent for low-carb and paleo diets. ‘Spaghetti’ (Heirloom, Open-Pollinated, 85 days) produce cream-colored, 3-5lb (1.4-2.2kg) fruit that turns yellow at maturity. Harvest when skin turns pale yellow, puncture with a fork, and bake. Discard seeds and separate flesh into pasta-like strands with a fork.